How do I set up a Double Opt-In? Learn about what double opt-in means, whether you should use it, and how to enable/disable it. 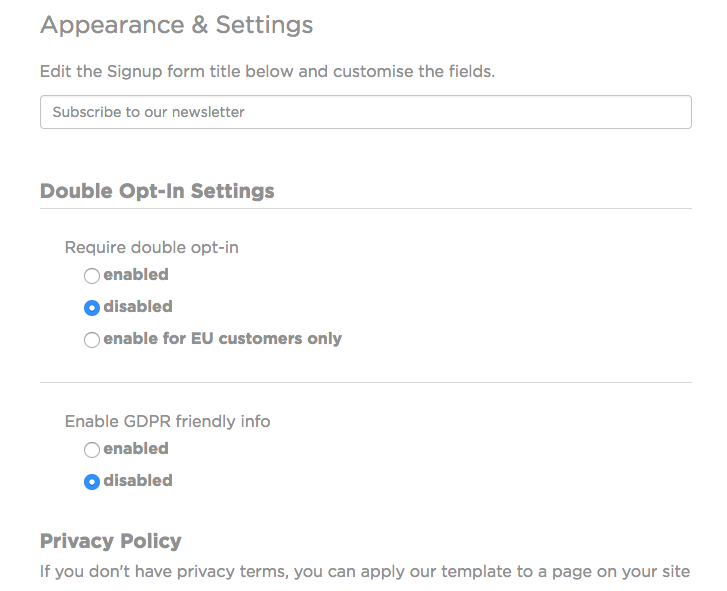 Double opt-in is a feature which you can enable/disable on your SmartrMail account which changes the way people sign up to your emailing lists. 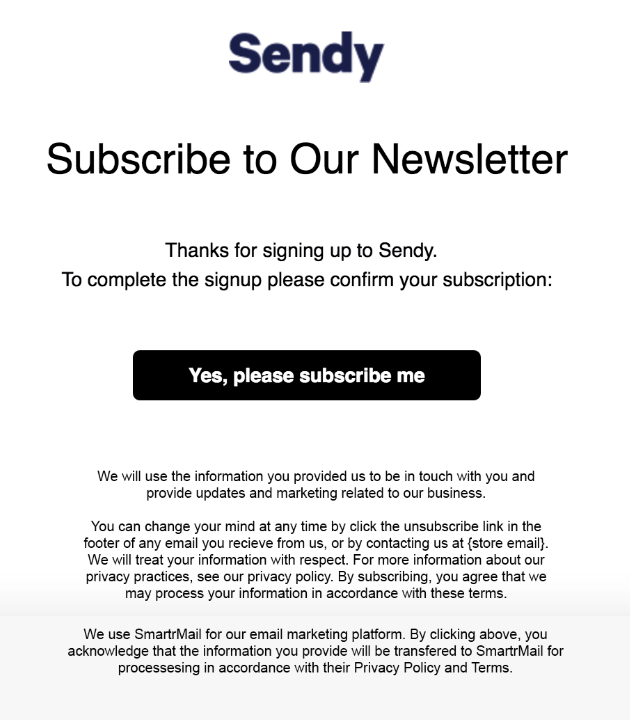 Typically, when someone signs up to a list, they simply add their email to a text field, perhaps along with their name, tick a box to confirm they agree to receive your emails, and then hit submit. After that they’re on your emailing list ready to receive future emails from your store. Double opt-in requires people take an extra step before receiving your future emails. This extra step occurs after they hit the submit button on your sign up form. Instead of immediately being added to your mailing list, they are instead sent an email asking them to confirm that they wish to subscribe to your emails. Within this email there will be a link they can click to confirm this. Below is an example double opt-in email. Double opt-in is an attractive feature for those wanting to make sure that their subscribers indeed want to receive their email campaigns. This is because this extra step practically eliminates the chance of people accidentally signed up without realising and stops people from signing up another person’s email address without their consent. Ensuring this is particularly relevant for stores dealing with EU residents to guarantee compliance with the GDPR. Because of this, double opt-in is enabled by default for stores that ship to the EU. For stores that do not ship to the EU, the feature is disabled by default. Should I Enable or Disable Double Opt-In? There are advantages and disadvantages with double opt-in. Because these are requirements of the GDPR, ensuring GDPR compliance is another major advantage of enabling double opt-in. The GDPR, however, does not require that you must have double opt-in enabled. As long as you’re upfront with what signing up entails and comply with the other requirements of the GDPR, double opt-in is not require, but does provide an extra layer of compliance. You can learn more about what the GDPR is, what it entails, and what you need to do to comply with it here. The only disadvantage to enabling double-opt in is that many signups are lost due to the extra step involved. That is, many people will sign up on your form, but will never click on the confirmation link in the email sent to them. This is why double opt-in is disabled by default for stores that do not ship to the EU. SmartrMail enables to the option to only require double opt-in for people signing up from within the European Union. When this feature is enabled, those outside of the EU will not be required to double opt-in but those within the EU will be. This might be the best option if you're looking to only implement double opt-in to ensure compliance with the GDPR. How Do I Enable/Disable Double Opt-In? With SmartrMail you can enable/disable the double opt-in requirement for individual lists. That means, if you have a particular list of popup signups, you can require double opt-in for people signing up through your popup only, and not from other forms. To change the double opt-in settings, you simply need to go to your Subscribers tab, then select the individual subscriber list you wish to change the settings for. Note: this can only be changed for manual lists, not for lists imported automatically from your ecommerce store. Once you’re on the list’s page, scroll approximately halfway down until you find the blue “customise form” button. Clicking on this link will take you to the list’s settings where you can either enable or disable double opt-in. If you select 'enable for EU customers only' then double opt-in will only be required for people signing up from within the European Union. Those outside of the EU will not be required to take the additional step to sign up to your emails. What is “Enable GDPR friendly info”? Clicking this option will mean that information will be included in the confirmation email outlining how the subscriber’s personal data will be used and their rights concerning this.